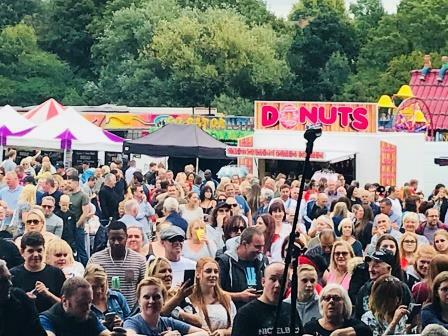 Music from the 70s, 80s, 90s and 00s brought a touch of nostalgia, and the crowds, despite torrential rain, to the 40th anniversary of the Havering Show last Bank Holiday weekend (26 and 27 August). An estimated 20,000 revellers braved the weather to hear S Club Party, Heatwave, Curiosity Killed the Cat, Baby D and a whole host of other acts over the two days in Harrow Lodge Park. “Once again it was great to see thousands of people enjoying themselves at what was the 40th anniversary Havering Show over the Bank Holiday weekend. “Despite the bad weather on Sunday, many still braved the rain and were determined to have a good time and we hope they did. “There was something for everyone at the show, from the music acts such as S Club Party, Baby D, Curiosity Killed The Cat and Heatwave to wrestling displays, fun fair, food and craft stalls plus a chance to speak to many Council services to get information.